Human activity recognition has the potential to become a real enabler for ambient assisted living technologies. Research on this area demands the execution of complex experiments involving humans interacting with intelligent environments in order to generate meaningful datasets, both for development and validation. Running such experiments is generally expensive and troublesome, slowing down the research process. 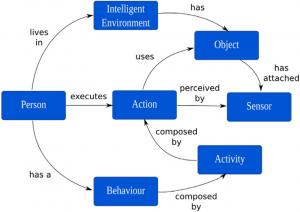 This paper presents an agent-based simulator for emulating human activities within intelligent environments: MASSHA. Specifically, MASSHA models the behaviour of the occupants of a sensorised environment from a single-user and multiple-user point of view. The accuracy of MASSHA is tested through a sound validation methodology, providing examples of application with three real human activity datasets and comparing these to the activity datasets produced by the simulator. Results show that MASSHA can reproduce behaviour patterns that are similar to those registered in the real datasets, achieving an overall accuracy of 93.52% and 88.10% in frequency and 98.27% and 99.09% in duration for the single-user scenario datasets; and a 99.3% and 88.25% in terms of frequency and duration for the multiple-user scenario.